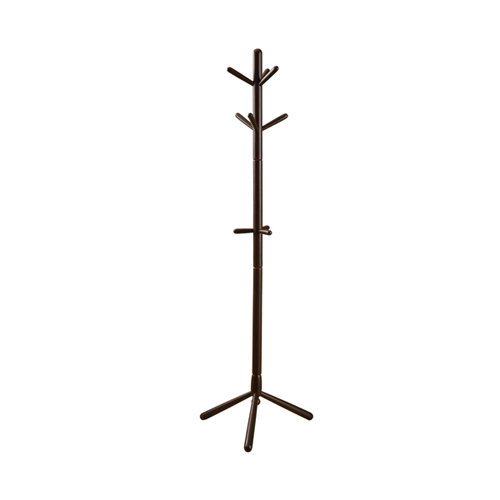 Organize your home with this contemporary solid wood coat rack. A beautiful lustrous cappuccino finish and a sturdy pedestal base bring plenty of stylish storage into your living space. The simplicity of the design makes it easy to create functionality in your entryway, hallway or living room. 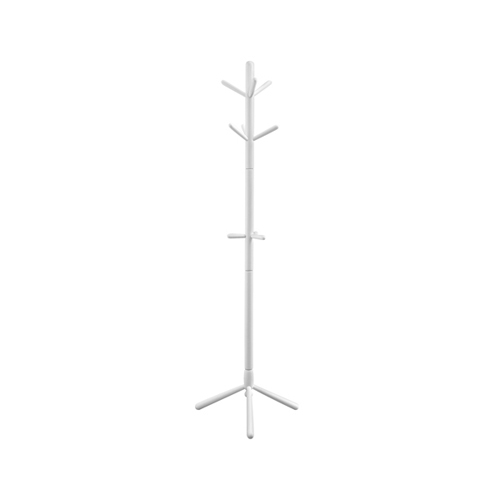 This triple tiered coat rack is ideal, convenient and a necessity for all. 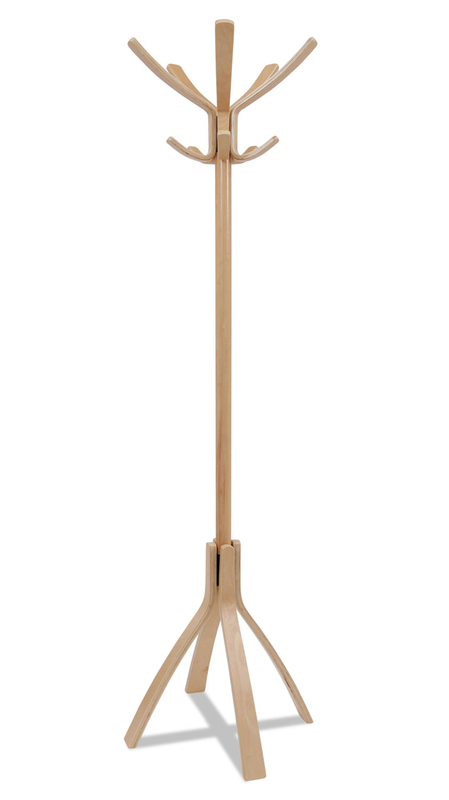 Organize your entryway, hallway or living room with this stylish coat rack with umbrella holder. The multiple hanging pegs allow you to keep your coats, jackets, hats and umbrellas organized and all in place. The black metal finish and sturdy pedestal base brings plenty of stylish storage to your living space. 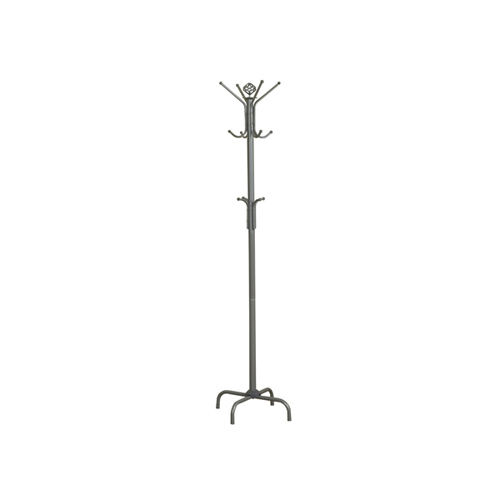 This practical coat rack with umbrella holder is convenient and a necessity for all. 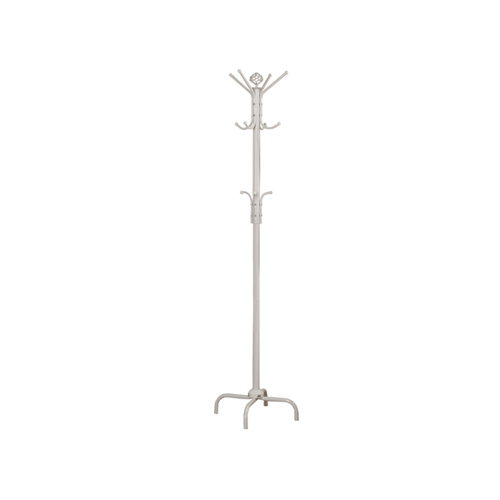 Organize your entryway, hallway or living room with this stylish coat rack with umbrella holder. The multiple hanging pegs allow you to keep your coats, jackets, hats and umbrellas organized and all in place. The silver metal finish and sturdy pedestal base brings plenty of stylish storage to your living space. 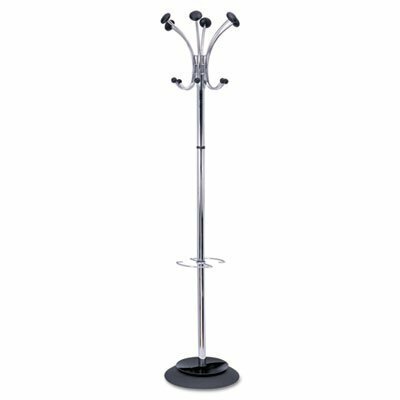 This practical coat rack with umbrella holder is convenient and a necessity for all. Give guests a warm welcome when you place a coat rack in your hall or entryway, or make the most of a compact space by tucking one into a corner of your living room. This black metal piece features double tiered hooks which enhances the functionality of any space and keeps everyday items like coats, hats and jackets neatly in place. 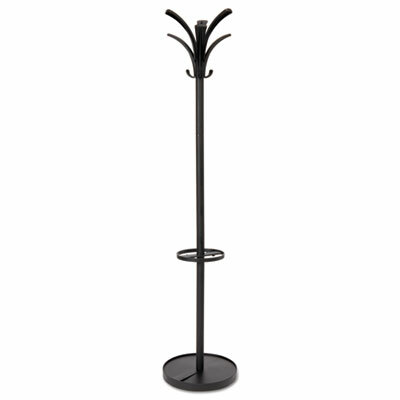 Organize your entryway, hallway or living room with this stylish coat rack with umbrella holder. The multiple hanging pegs allow you to keep your coats, jackets, hats and umbrellas organized and all in place. The white metal finish and sturdy pedestal base brings plenty of stylish storage to your living space. 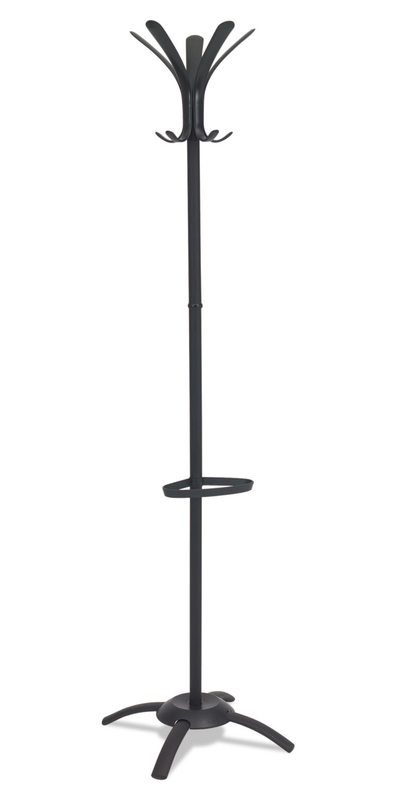 This practical coat rack with umbrella holder is convenient and a necessity for all. A turned post with hanging pegs takes a creative turn in the form of a beautiful braided detail at the center of this coat rack. Curved feet anchor the base and a rounded finial crowns the top of this piece. A sampling of pegs at the peak of the rack offer plenty of storage space for hanging coats, hats and other clothing items. 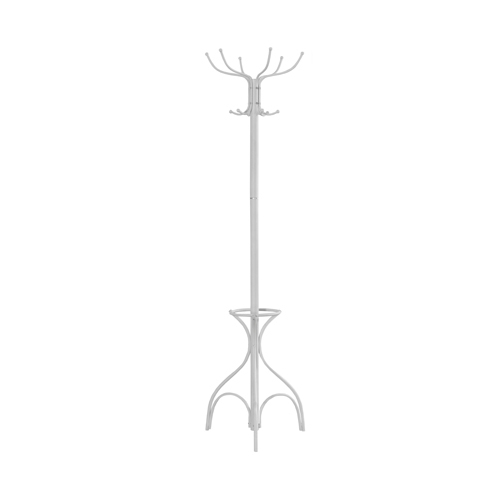 The antique white finish warms up any room and refines the classic approach of this coat rack with the braided post. A turned post with hanging pegs takes a creative turn in the form of a beautiful twist detail at its center on this coat rack. Curved feet anchor the base and a rounded finial crowns the top of this functional hall tree. A sampling of pegs at the peak of the rack offer plenty of storage space for hanging coats, hats and similar clothing items. The cherry finish makes for a casual presentation that instantly warms up any room, while the warm cherry further refines the classic good looks of this coat rack with twisted post. 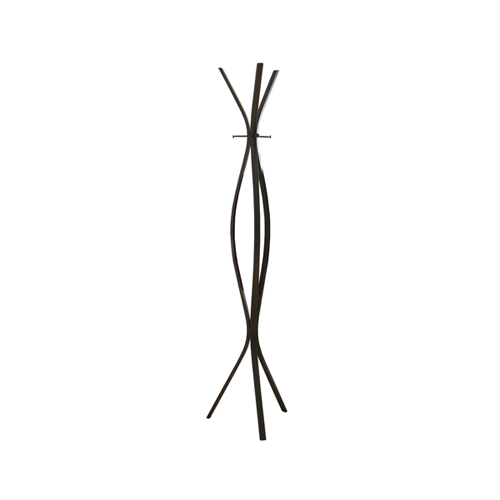 Enhance the look your entryway or hallway with this elegant traditional hammered black metal coat rack. A lovely accent piece on its own, this piece will help to keep you organized in style. The multiple hanging pegs allow you to keep everyday items like coats, hats and jackets neatly in place while the classic appeal is reminiscent of a romantic Parisian apartment that will provide you with years of lasting enjoyment. Enhance the look of your entryway or hallway with this unique branch inspired coat rack. The multiple hanging pegs allow you to keep your coats, jackets and hats organized and all in one place. The sturdy metal construction paired with a hammered black finish makes this updated spin on a classic design a must have for any home. High capacity with six knobs and three hooks. Kind to clothes thanks to the large rounded pegs. Smart umbrella holder (up to six umbrellas) and a water retainer. Rotating head for easy access to clothes. Great stability with its weighted base. Easy assembly without tools. 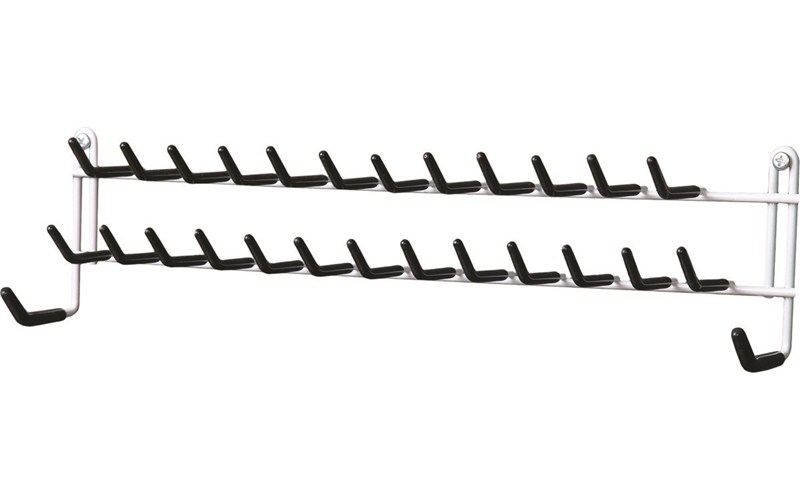 Mounting: Stand Alone; Width: 13 3/4"; Depth: 13 3/4"; Height: 66 1/4". A classic design with contemporary flair. 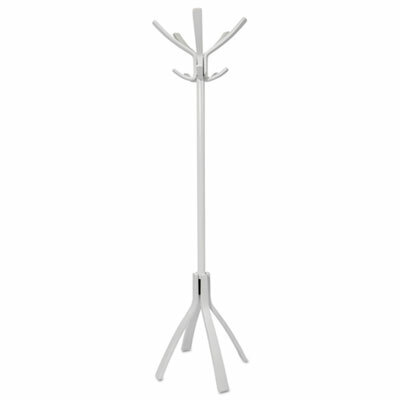 Five large coat pegs and five coat hooks on an easily-accessible rotating head. Large base with four feet for stability. Fast and easy tool-free assembly. Mounting: Stand Alone; Width: 21 2/3"; Depth: 21 1/2"; Height: 69 1/3". A classic design with contemporary flair. Five large coat pegs and five coat hooks on an easily-accessible rotative head. Large base with four feet for stability. Fast and easy tool-free assembly. Mounting: Stand Alone; Width: 21 2/3"; Depth: 21 2/3"; Height: 69 1/3". Steel tubing with weighted black base. Stylish and functional. Provides six coat knobs, six accessory hooks and an integrated umbrella stand with water retainer. Mounting: Stand Alone; Width: 16"; Depth: 16"; Height: 70 1/2". 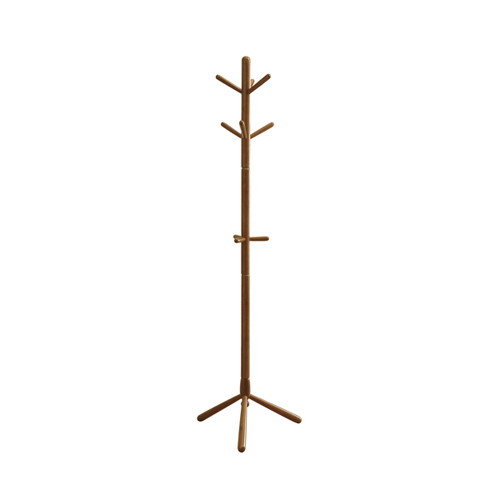 Organize your home with this contemporary solid wood coat rack. A beautiful lustrous oak finish and a sturdy pedestal base bring plenty of stylish storage into your living space. The simplicity of the design makes it easy to create functionality in your entryway, hallway or living room. This tripled tiered coat rack is ideal, convenient and a necessity for all. Organize your home with this contemporary solid wood coat rack. A beautiful lustrous white finish and a sturdy pedestal base bring plenty of stylish storage into your living space. The simplicity of the design makes it easy to create functionality in your entryway, hallway or living room. 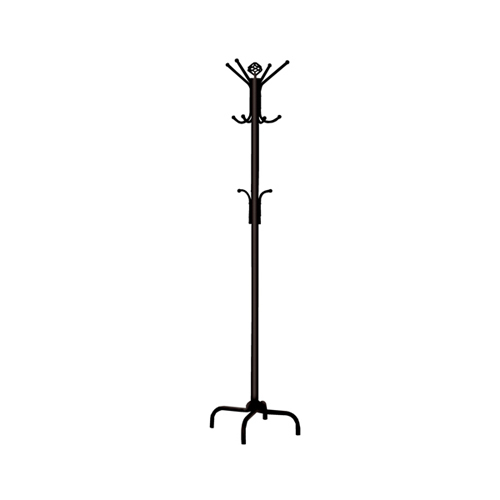 This triple tiered coat rack is ideal, convenient and a necessity for all. 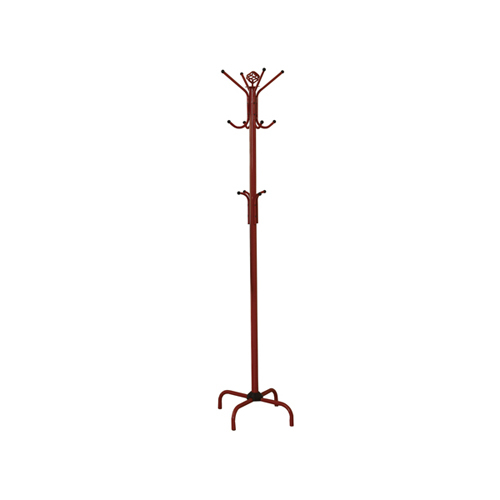 Let this bright red metal coat rack enhance your home with excellent functionality. There is plenty coat, hat, glove and umbrella storage with 2 tiers of hooks. 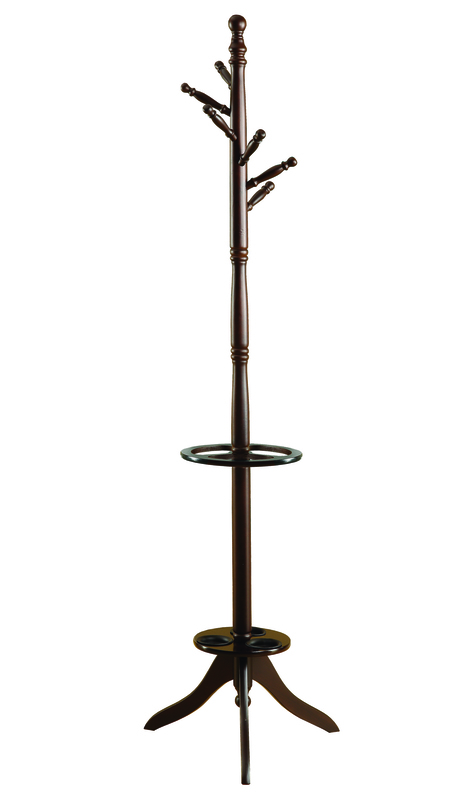 A beautiful finial adds a touch of class to this fashionable coat rack. 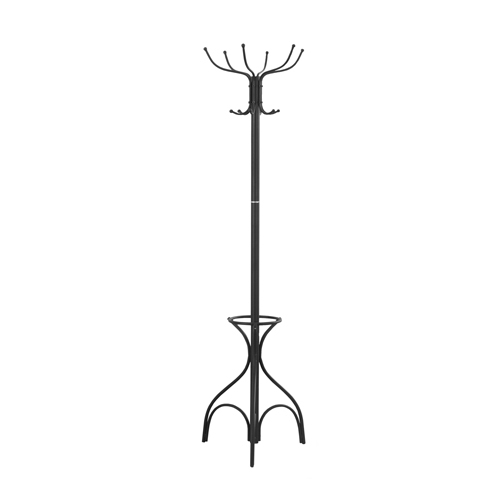 Bring fashion to your home with this unique black metal coat rack. With a geometric design and ample storage to hang coats, scarves, sweaters or hats, this modern coat rack will help keep you organized in style. 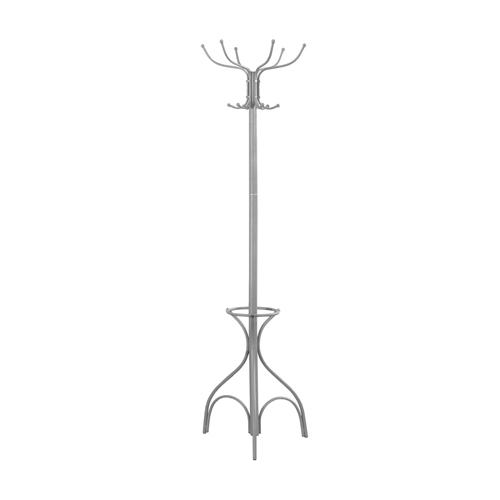 Complete the functionality of your home with this contemporary coat rack. 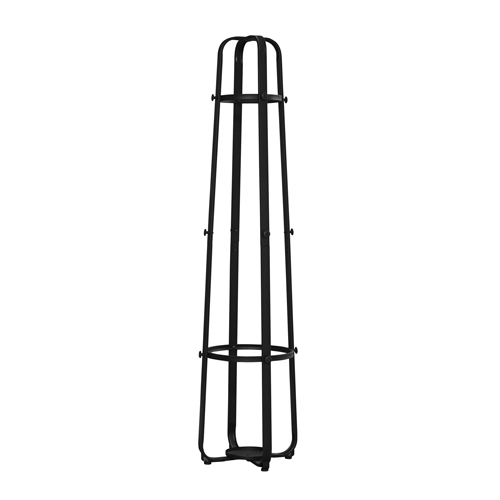 Beautiful 72" high black metal legs provide sturdy support and bring plenty of stylish storage into your living space. 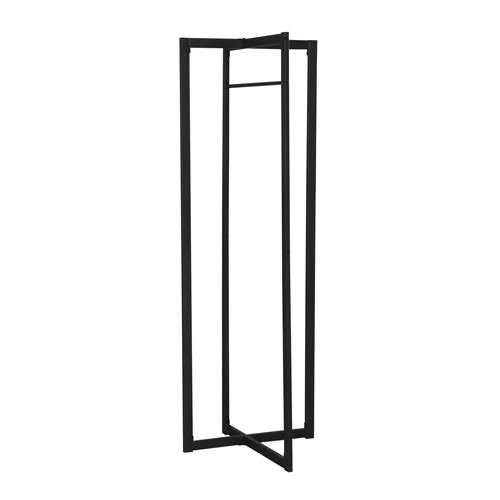 This coat rack makes it simple to organize your entryway, hallway or living room. A modern and chic look complete its stylish appeal. This contemporary coat rack offers a unique look with all the functionality you would expect to help organize your living space.The multiple hanging pegs allow you to keep your coats, jackets and hats organized and all in one place, while the base conveniently stores your umbrellas. The sturdy metal construction paired with a black finish makes this updated modern spin on a classic design a must have for any home. 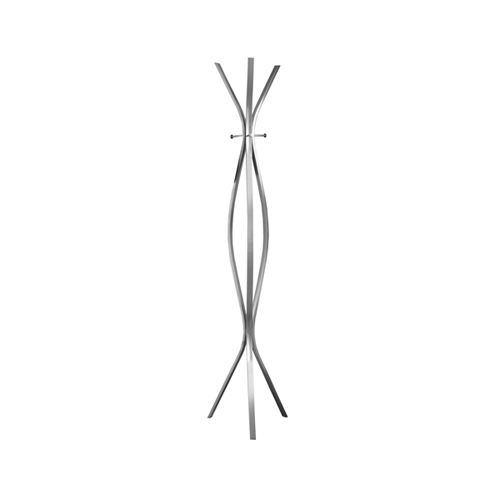 Complete the functionality of your home with this contemporary coat rack. Beautiful 72" high cappuccino metal legs provide sturdy support and bring plenty of stylish storage into your living space. This coat rack makes it simple to organize your entryway, hallway or living room. A modern and chic look complete its stylish appeal. 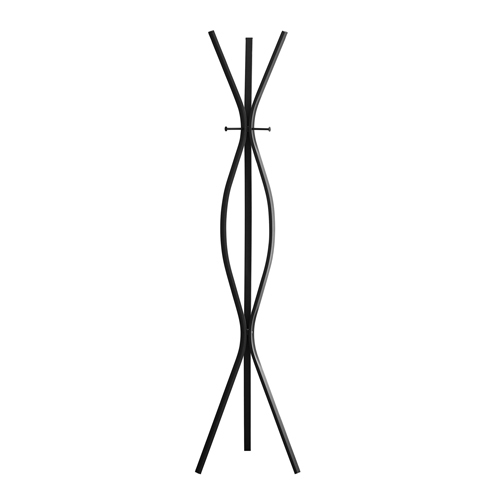 Bring fashion to your home with this unique satin black coat rack. 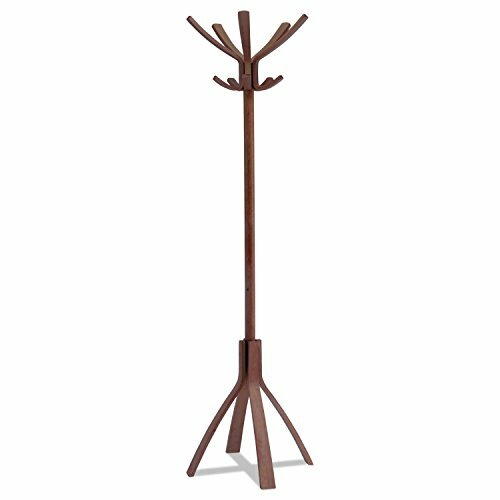 With ample storage to hang coats, scarves, sweaters or hats, this modern coat rack will help keep you organized in style.